The Best of Teacher Entrepreneurs II: Language Arts Lesson - "Poetry Writing and Analysis using 'Hope is the Thing with Feathers.'" Language Arts Lesson - "Poetry Writing and Analysis using 'Hope is the Thing with Feathers.'" I never tire of this poem! I love to teach it and am always surprised and delighted by class discussions and the poems my students write in response to it. This is a great poem to teach any time of year. This lesson guides students through a careful analysis of Emily Dickinson's poem "Hope Is the Thing With Feathers." By middle school, most students are familiar with figurative language like simile and metaphor, so this poem offers a great opportunity to review those terms along with the concept of abstract nouns. There are five parts to this lesson. Parts I and II "unpack" the meaning of the poem by having students examine vocabulary and practice paraphrasing. These are excellent activities for pairs or small groups. Part III includes Bloom's taxonomy comprehension questions. These can be used as an assessment, or students can answer the questions on their own after they've worked on the vocabulary and paraphrasing activities. The questions can then be used for a whole-class discussion. Part IV and V offer students the opportunity to write their own poems. Finished poems can be illustrated and displayed. This 1861 version of "Hope is the Thing With Feathers" is in the public domain. The lesson includes all materials you need to teach this beautiful poem! 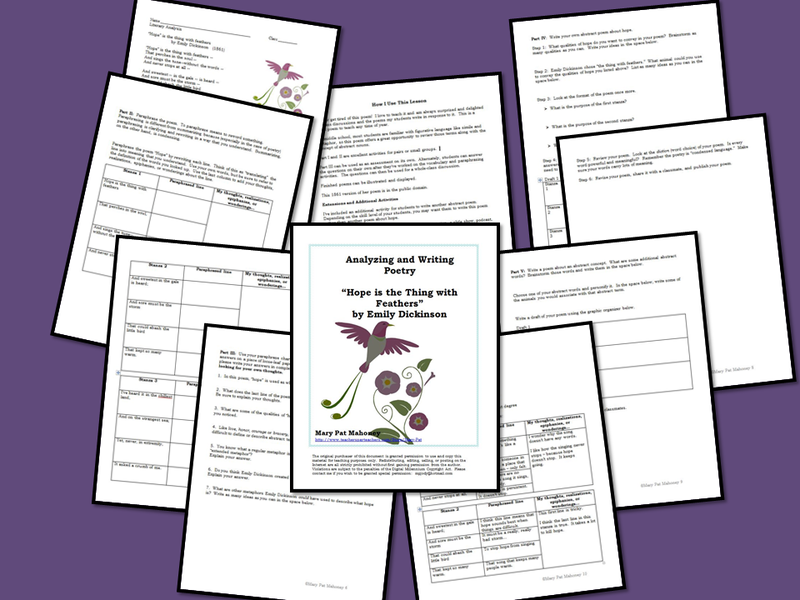 Enjoy reading and writing poems with your students!